MACH can offer tower internals in various styles and materials, including exotic alloys ceramic, graphite, plastics and stainless steel. We take special care in designing liquid and vapor distributors to provide uniform distribution to the packed bed and pay special attention to process considerations such as fouling and foaming. Our process engineers can help you optimize performance in new or existing towers by assisting in the selection of the most efficient internals for your specific application. In trough distributors liquid is introduced into the parting box, which properly distributes the liquid into the laterals. One parting box is required for 3-8 feet diameter towers. 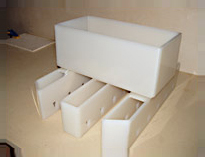 Multiple parting boxes can be used for larger diameters or high liquid rates. It is generally used in towers with high liquid rates or fouling service. Turndown characteristics are at least 8:1. LDL is a pipe-ladder type which can be designed for a wide variety of applications. It is a pressure driven distributor where the liquid is delivered through metering orifices in the branch pipes. Typical pressure drop is 1-5 psi. LDL distributors are commonly utilized in scrubber and stripper services with moderate-to-high liquid rates. The LDL is not recommended for low liquid rates or fouling sys-tems or ones with suspended solids due to the potential for plugging of the metering orifices. Conditions which favor the use of an LDL include high vapor velocities and limited space availability. LDL distributors can be made in a variety of plastics and alloys. Spray nozzle distributors are important when a uniform distribution pattern is critical due to short bed heights. 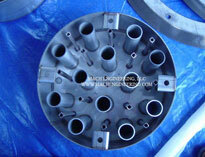 They are primarily used for heat transfer and refinery applications. The typical turndown of a spray distributor is 2:1 at a pressure drop across the nozzles of 10-15 psi. 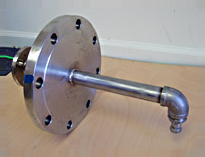 They can be designed for liquid rates as low as 1/2 gpm/ft2 of tower area. Collector Redistributor is very similar to the LDO in that it will contain a deck and chimneys. The collector is used under a packed bed section to collect the liquid to aid in mixing and redistribution. The difference is that the CRO will contain caps or hats to prevent the water falling from the packing from bypassing the collector. Is versatile in design and construction depending on the application requirements. With tall vapor risers, large holdup volumes can be retained on the deck. One or more sumps, downcomers or downpipes can be provided. Spargers Vapor distributor is used when a vapor feed requires uniform distribution across the tower area. Typical applications include vapor feed at the bottom of the tower or between beds. When used at the bottom of a tower it can save tower elevation compared to a typical elbow down vapor inlet. When used between beds, it will ensure that the vapor feed is well distributed and well mixed with the vapor from the bed below. To achieve good distribution the required pressure drop across the vapor distributor is determined by the flow rate and size of the inlet. Turndown is generally 4 : 1, but can be higher or lower depending upon the allowable pressure drop for the process. Is a device used to hold the packing. It generally sits on a support ledge and can be supported additionally by structural beams. There are two design criteria for the multi-beam support plate. It must hold the packing and liquid hold-up but also requires an open are greater than the cross sectional area of the tower. 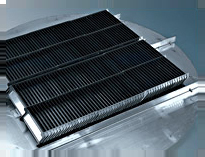 The larger open area is accomplished by using slotted or perforated plate that is corrugated or positioned in such a way to allow increased gas flow. Open area ranges from 85% to greater than 100%. Packing Support Grids are the simplest and least expensive type of packing supports. They also utilize the least vertical space. They are designed for low to medium gas loading when used for dumped packing and typically have 50 to 90% open areas depending on the material used. 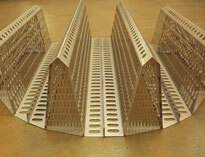 The support grids are available in various materials such as plastic, FRP and metals. They can also be used as bed limiters. Sometimes support beams are required for structural reasons depending on the material and size of the support grate. The main purpose of the bed limiter is to limit the packing bed from moving and to maintain the top surface of bed level. They are fastened to the walls of the column or freely placed on the packing. 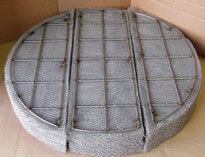 Mesh Mist Eliminator consist of coils or layers of knitted wire mesh held together by top and bottom support grids. 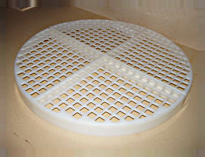 The mesh material can be metal or plastic, depending on the application. Chevron Mist Eliminator are suitable for high liquid load, dirty services and high capacities. Droplet sizes down to 10 microns can be removed. ME2’s can be applied in horizontal or vertical up flows and are available in plastics or metals. For installation purposes, the units are made in sections to pass through manways. MACH Engineering is a longstanding expert in chemical process tower internals, offering a range of custom and semi-custom products that can be designed to your specifications. Let us work with you to find solutions that are appropriate for your business — follow the links below to explore our capabilities, or contact us directly to request a quote. 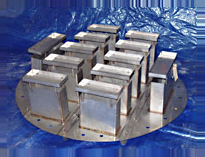 Liquid orifice distributors: Orifice pan distributors allow gas to pass through a series of risers while liquid flows through holes in the pan floor. We do not recommend using this type of distributor in fouling applications. 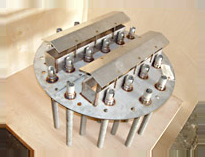 Liquid trough distributors: Trough distributors use a parting box to divert liquids into different laterals. A tower between 3 to 8 feet tall will typically require one parting box — multiple boxes are stackable for use in larger vessels. This option is suitable for high liquid rate and fouling applications. 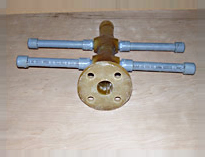 Liquid ladder distributors: Lateral pipe distributors are pressure-driven distributors that send liquid through a series of metering orifices in the branch pipes. Typical applications include scrubber and stripper services with moderate to high liquid rates. Liquid spray nozzle distributors: Spray nozzle distributors help ensure uniform pattern distribution in towers with short bed heights. They’re ideal for heat transfer and refinery applications. Liquid collector-redistributor orifices: Collector-redistributors install under a packed bed section to collect liquid and help with mixing and redistribution. A series of caps or hats prevents water from bypassing the collector. Liquid draw-off collectors: MACH Engineering liquid draw-off collectors are versatile and customizable depending on an application’s requirements. 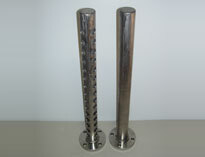 Options include tall vapor risers for retaining large holdup volumes and downpipes for use with one or more sump. Gas distributor spargers: Spargers deliver a uniform distribution of a vapor feed across a tower area. Install them at the vessel bottom to save tower height compared to an elbow-down vapor inlet, or between beds to promote better mixing with the vapor feed below. Multi-beam packing supports: Multi-beam packing supports install on a ledge to provide support for tower packing. They can be further augmented with structural beams to ensure adequate capacity for both the packing and liquid hold-up. 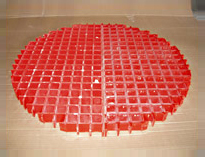 Packing support grids: Plastic, metal or FRP grids are our most economical packing support solution. Use them for low to medium gas loading. They can also double as bed limiters. Bed limiter grids: Limiters prevent packing beds from moving and maintain a level surface on top. Our products install directly on the tower walls or sit freely on the packing itself. Mesh mist eliminators: Mist eliminators help remove liquid droplets from a vapor stream, improving purity, preventing equipment damage and reducing air pollution. Our mesh-type eliminators are available in metal or plastic and in a range of configurations. Chevron/Vane Type mist eliminators: Chevron mist eliminators deliver more reliable performance in high-velocity and high-capacity applications, particularly those where a mesh-type product would clog easily. Our engineers would be happy to work with you and determine the best selection of products for your application. To learn more about your options, reach out to us now.